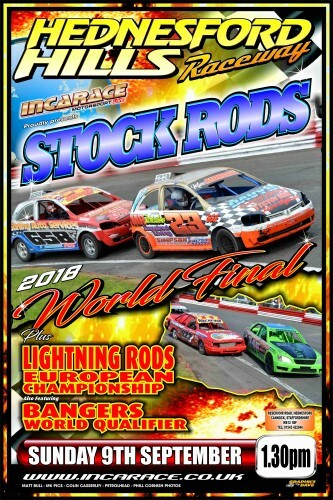 Sunday 9th September is a big day in the world of Stock Rod and Lightning Rod racing at Hednesford Hills Raceway, kindly sponsored by 1KE Engineering. The top 40 Stock Rod drivers will be competing for the coveted Gold Roof in the 2018 World Championship and Lightning Rods will be chasing the red and yellow chequers of the 2018 European Championship. Firstly, due to local Council restrictions we are not allowed to offer any overnight accommodation either inside the stadium or indeed in the vicinity outside the stadium. 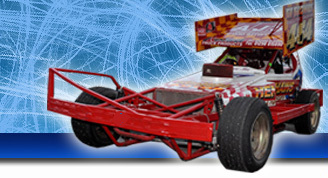 Drivers who are travelling/arriving overnight should plan to park up away from the raceway and then make their way to Hednesford in readiness for opening time. The Pit Gate will open at 9.30am. Remember when you are unloading your car, there can be no engine noise whatsoever until midday. Scrutineering will take place in situ in your Pit Area. We have planned a short session of ‘familiarisation’ for Stock Rods and Lightning Rods prior to racing. Lightning Rods will be first and dependent upon numbers will be either be split into two session of just all in. The session will be 10 laps. Stock Rods will then be given their opportunity, which will be split into two sessions. The sessions will be 10 laps each and drivers are only allowed to take part in one session – without exception. The qualifying heats are reverse grid, via an Incarace draw for the first heats and then the highest point scorers to the front of the Championship grid respectively. We would like to wish all drivers the very best of luck in their respective Championship races. The Race order will be available from the website later in the week.